Which City Has the Busiest Metro System? Beijing has the busiest metro system of anywhere in the world. A busy subway station in central Beijing, China. Beijing has the busiest subway station in the world. Editorial credit: aphotostory / Shutterstock.com. The Beijing Subway is the metro system that serves the entire city of Beijing. 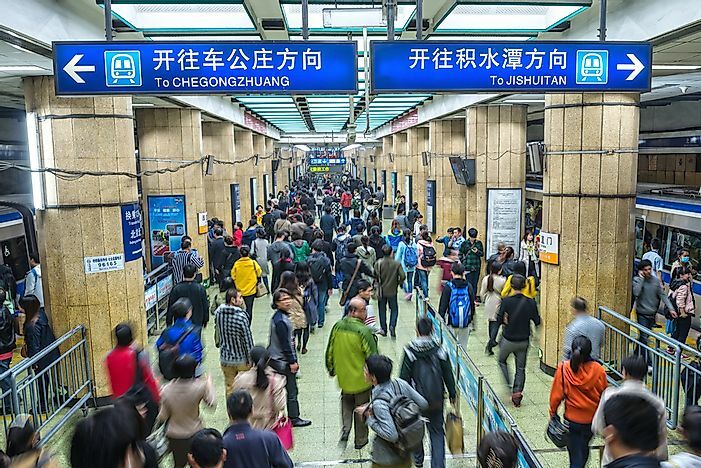 With an annual ridership of 3.66 billion, the subway is the busiest not only in China but also in the entire world. The daily average of riders in the system stands at about 9.99 million, but the highest the metro has recorded to date was a record 12.69 million in a day. The Beijing Subway also holds the record for the highest number of lines, as it is made up of 22 lines. The metro system is the world’s second-longest, with its total length of 372.4 miles being only surpassed by yet another metro system in China, the Shanghai Metro. Operations in the Beijing Subway are primarily run by the Beijing Mass Transit Railway Operation Corporation, a state-owned entity. The metro system is set to go through an ambitious expansion project, to increase its total length to 621 miles by the year 2021. The entire stretch of the metro system runs on a 1,415-millimeter standard gauge track and it is serviced by a DC 750 V third-rail for electricity, except Line 14 and Line 6 which are both powered by overhead electric wires. 370 stations make up the Beijing Metro System, exceeded only by the Shanghai Metro which has a total of 387 stations. Each of these stations has elevators, escalators, and ramps for ease of access to persons with disabilities. The Airport Express Line has the fastest trains on the metro, which have maximum speeds of 68 miles per hour. The trains on these lines have 4-car sets, contrasting the 6-car sets seen on trains in most of the Metro's other lines. Russia’s Moscow Metro inspired construction of the Beijing Metro, and while it was aimed at expanding the city’s mass transit system, the Chinese government wanted to construct it in such a way that it would also have military applications. Plans for the construction were rolled out in the 1950s, with the country relying on technical assistance from the Soviet Union. The project was later dropped, albeit temporarily after diplomatic relations between China and the Soviet Union deteriorated in the early 1960s. After years of being shelved, the Beijing Metro’s construction would commence in July 1st, 1965 after being commissioned by China’s leader Mao Zedong. The construction was not without controversy as it resulted in the demolition of important cultural structures such as the city’s “Inner City Walls.” Construction of the first phase of the metro was complete by 1969 and started pilot operations on October 1st, 1969, a date that coincided with the Peoples Republic’s 20th anniversary. The metro’s inaugural line, Line 1 connected Beijing Railway Station with Fushouling, running a total of 13 miles. The metro has witnessed several fatal accidents in some of its stations, and as a remedy, numerous safety precautions have been employed. Initially, shops and vendors were in large numbers in the stations, but these were all removed as their restricted movement in case of emergency evacuations. The Xidan station was particularly affected by the purge, as the station housed a popular shopping mall, which was also removed. Which City Has the Longest Metro System?